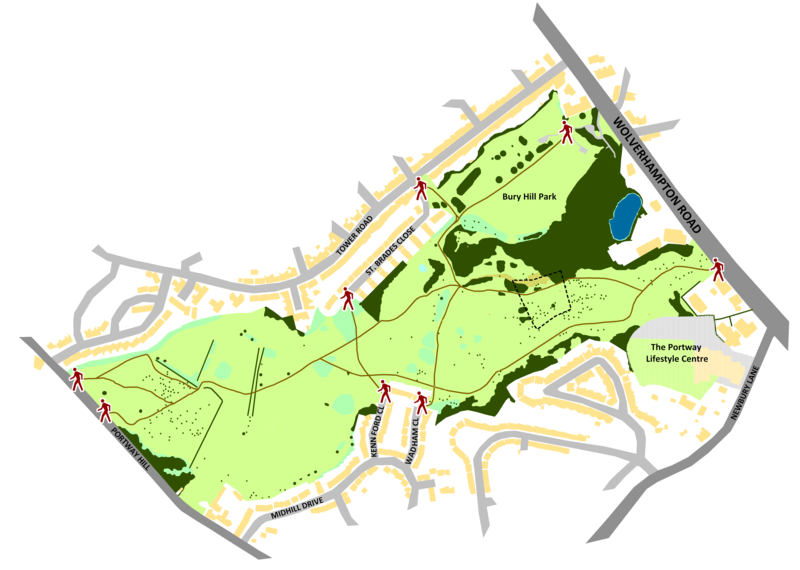 The hills are open to the public all year round and can be accessed from several locations: the Wolverhampton Road between the BP Garage and Brewers Faye ‘Lakeside’, Bury Hill Park, St. Brades Close, Portway Hill, Kennford Close and Wadham Close – see the map below. Map of the Rowley Hills showing paths and access points. If you’re visiting by bus, routes 20, 89, 121, 126, 127, 208 and 289 all stop nearby – see National Express West Midlands for further information. If you’re driving, there is no dedicated parking, but it is usually possible to park in the carpark of the Premier Inn or KFC off Wolverhampton Road. In March 2017 our volunteers re-opened the Public Right Of Way (PROW) through the old quarries on Portway Hill, which had become so badly overgrown it was impossible to negotiate. To find the PROW, access the hillside from St Brades Close (from the end nearest Tower Road). Upon reaching the wooden waymarker post, instead of turning left or right go straight on. Descend the slope where the path has been cut through the bank and stay on this path which curves round to the left and then descends a relatively steep bank enclosed with shrubs on both sides. At the bottom of this bank the path curves right and then left to meet the main PROW about 80m down from the Wildlife Trust cairn. The map below shows the Rowley Hills’ location in relation to the surrounding area.